Coming of age as a young Maasai in Africa required a series of rituals, followed up by an act of extreme courage. If you were successful and didn’t die in the process you became a Maasai warrior earning the respect of the tribe. This was the practice for centuries. It was not questioned as right or wrong but was the expected goal of every young boy. The island of Bermuda is a wreck dive paradise. The island is surrounded by ship wrecks of all types. 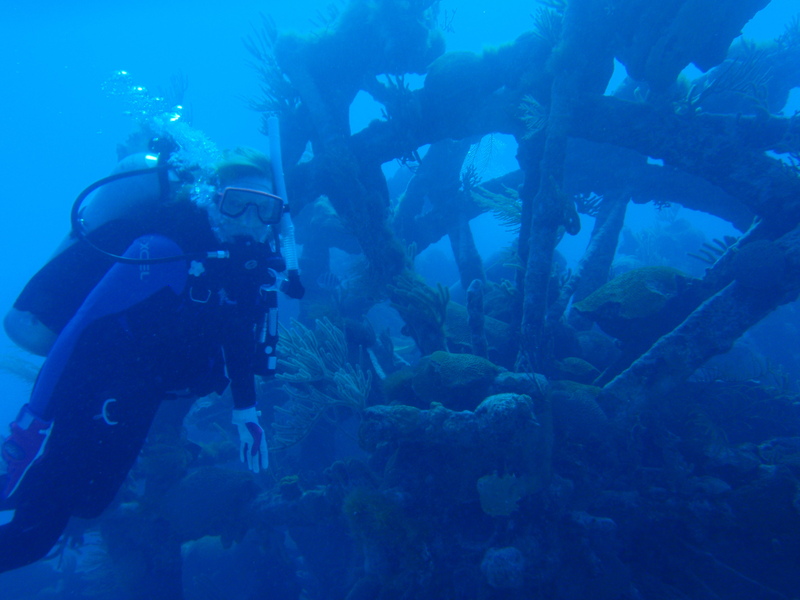 The 'Mary Celestia' is one of the more famous wrecks. The ship was a steam powered side paddle boat and was sunk in 1864. This is a photo of Pam next to what's left of one of the paddle wheels. The ship was running guns for the Confederacy during the Civil War. The Confederates would trade cotton with the English for guns and then run the blockade back to the south. She was a victim of the many reefs around the island. We were diving off a small, remote island called Mayaguana, the easternmost island in the district of the Bahamas. The diving there wasn't that good. There's about 30 local residents and not much in the way of services. They have medical folks who show up about once a month. 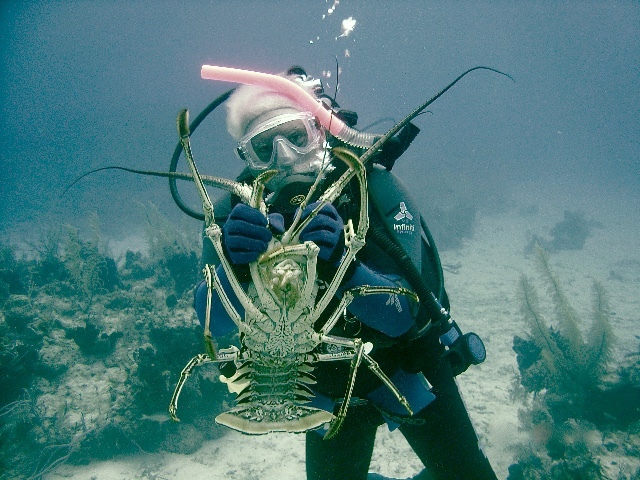 I'm swimming along and there's a good size lobster walking across the sand so I grabbed him. He didn't make it to the dinner table, I let him go. The wreck of the 'Hermes' is also a popular Bermuda wreck site. There was a large Lion Fish waiting for me when I arrived. Shortly after that he was speared and later met me for lunch. Lion fish are delicious! The 'Hermes' was a U.S. Coast Guard WWII buoy tender that was sunk as an artificial reef in 1985. 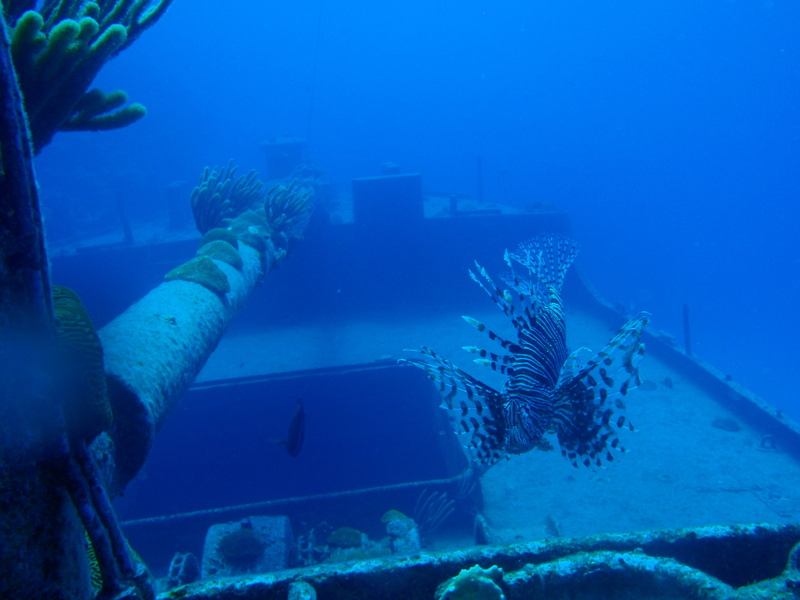 Fore more information about Lion Fish in Bermuda, check out the Lion Fish Task Force.